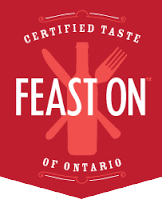 Educate the public about Ontario food and drink and to bring further awareness to its strong agricultural sectors. While there are various criteria in qualifying for the Feast ON designation, our procurement boasts over 75% menu ingredients sourced locally and over 85% alcohol beverages sourced locally (or in the case of Northwinds beer, brewed in-house). In fact, the only alcohol beverages we serve that are sourced outside of Ontario include some wines and liquor. Our beer (obviously), guest taps, ciders, some wines and liquors are all Ontario based. When you visit Northwinds, you are being served the freshest meals and beverages available.